Do people around me see my emotional intelligence as I do? The Workplace EQ 360 assessment will answer this question. 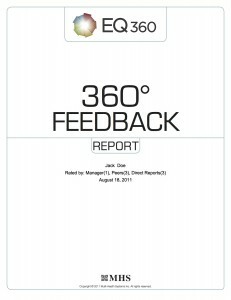 EQ 360 is a multi-rater version of the EQ-i 2.0. It assesses the same emotional & social skills that make up a person’s emotional intelligence, but from various perspectives: one’s own, as well as one’s manager’s, peers’, direct reports’, friends’ and/or family’s. The Workplace EQ 360 provides the individual with very rich data for identifying the blind spots and personal development. It’s truly the “Rolls-Royce” of EI assessment.